Get Lost. In Rome, that is! Tonight we saved our "breakfast" for later than usual, and we savored our delicious pizza until nearly midnight. From there we wandered for a while before following the multilingual murmur of the Spanish Steps. The steps are named as such due to the former Spanish Embassy having once sat in this spot (though I previously assumed that perhaps a Spanish architect had designed the space). Though most of Rome has quieted by this hour, the steps are alive! Ascending the stairs we pass a variety of families, lovers and winos. Grabbing a bottle of bianco at a nearby restaurant who's bar keep was just packing up, we settle onto a ledge high above the city streets. Not only is the art in Rome a lovely spectacle, but I think the absence of an "open-container" law is a beautiful thing! It's quite common, and not remotely frowned upon, to stroll about with a beer or drink in hand. Time passes briskly and the city below quiets without warning as we're talking, laughing and enjoying our midnight picnic. Quite content, and a tad tipsy, we take up our wandering yet again. Allowing the winding cobblestone alleys to swallow us up, releasing us into one still piazza after another until we stumble upon the stunning Piazza Navona. Here I can regale my husband with the stories and works of a most beloved artist of mine, Gian Lorenzo Bernini, as we sit at his Fontana dei Quattro Fiumi (or fountain of the four rivers). 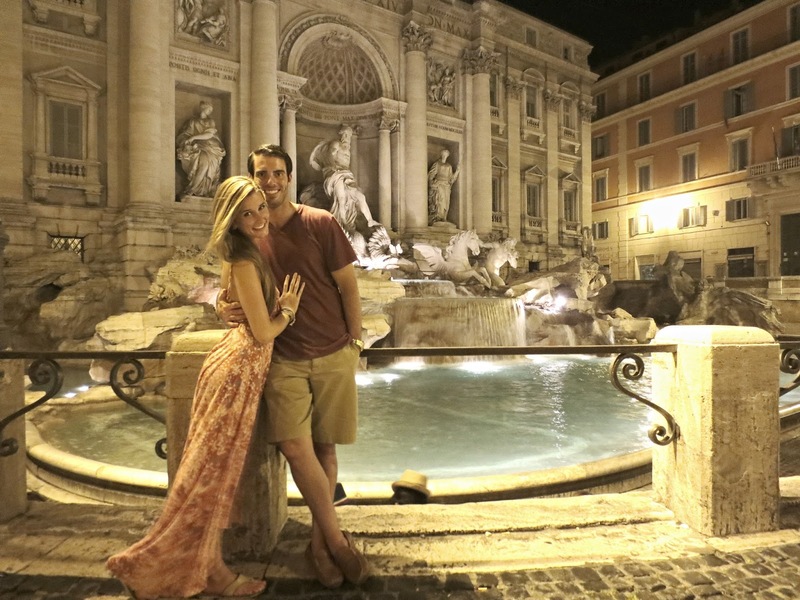 Onward we move to (what I consider to be Rome's true gem) the Trevi Fountain. Once a terminal point for an aqueduct at the meeting of three roads ("tre vie"), it served a utilitarian purpose for 400 years. 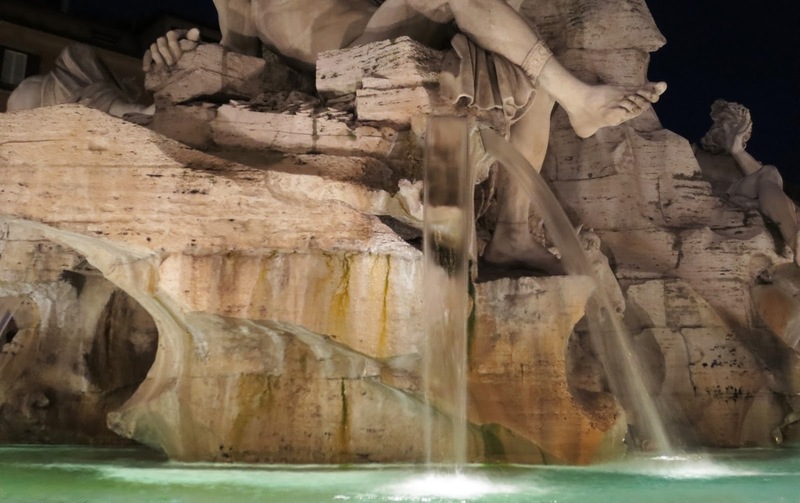 Now, as one of the most famous fountains in the world, this gorgeous piece of art draws innumerable visitors from dawn to dusk - it is difficult to catch a glimpse and impossible to sit and appreciate. So, a 3AM trip to the Fontana di Trevi it is then! We are in fact the only one's here, aside from, two crotchety old cops (if not for whom, I would certainly have jumped in - Audrey Hepburn style!). A moment alone (or an hour in our case) to basque in the ferocity of the great Tritons, rolling forth with winged horses from seemingly fluid waves of travertine - is absolutely priceless. 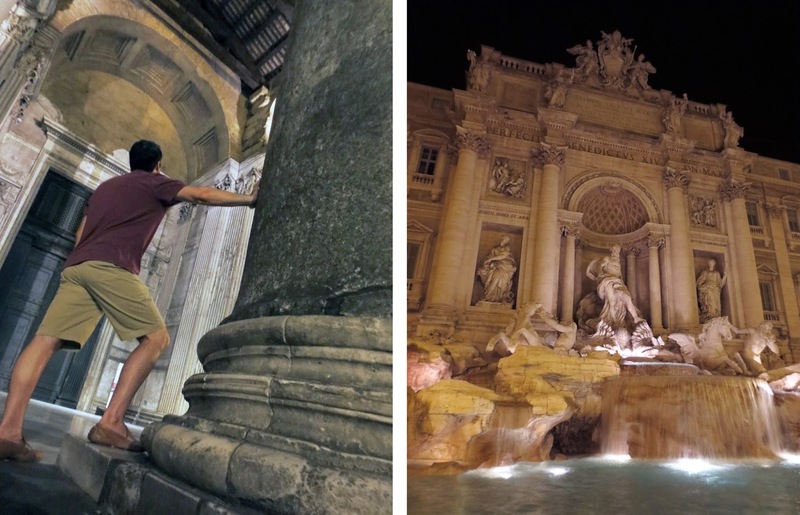 Ancient Romans threw coins into fountains to appease the gods of water, and today a tradition has developed of tossing coins over one's shoulder and is rumored to ensure your return to Rome! It turns out that this folklore provokes enough travelers to toss in a coin that the collection averages 3,000€ each day. Cool news is, most of it goes straight to charity organizations. So toss (and wish) away! After lingering for some time at the majestic fountain we take the long way home, temporarily avoiding our inevitable goodbye to Rome. Well... our intent was to take the long way - turns out it was actually the wrong way! We are lost. Getting lost is what you make of it though, and as we have absolutely no where better to be - this is a nice kind of lost. The romantic and cinematic kind of lost. After a few hours of content confusion we feel grass and gravel beneath our feet. Not by some grand architectural landmark, but simply by the size and shape of this dark, grassy meadow we know we're standing where once the Circus Maximus stood. Beneath our feet is the ground upon which roman chariot races were held before 250,000 spectators in the 6th century BC! Finally, we know where we are. The Arch of Constantine marks familiar territory as the sun prepares for today's debut just below the horizon. For now, we'll trade places with the big orange ball as we settle in to rest, preparing for our first adventure on the European Railways later today. As we begin our day tonight, the first stop on the agenda is St. Peter's in Vatican City. 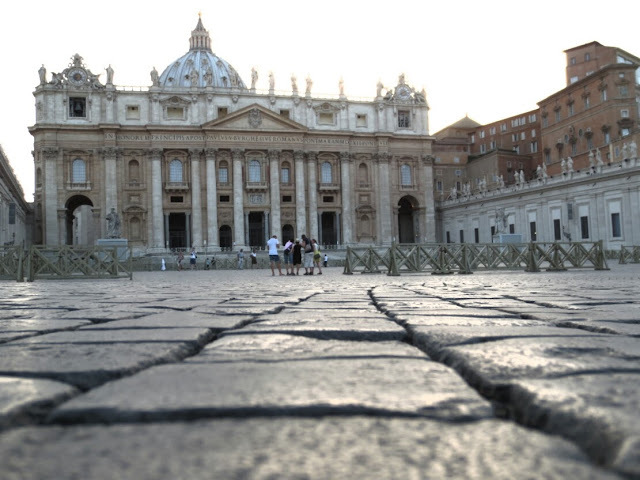 The enormous square of St. Peter's was constructed in such a way to allow as many people to gather, and to be blessed by the Pope, at one time as possible. Throughout the day these grounds are packed column to column... but tonight we only have to share the space with a few stragglers and a number of Roman pigeons. Though the sun has not set, its light is partially blocked by the dome of the Basilica. The remaining light is remarkably soft, giving this holy place a heavenly glow. In the absence of the crowds we do not have to fight for an opportunity to stand at the white medallion at the center of the ellipse shaped piazza. From this spot we can appreciate the splendor of Roman architecture once again, as the Doric columns seem to disappear one behind another. This illusion, created by Bernini, is surprisingly fun to experience for yourself! We've left ourselves just enough time to grab a drink on-the-go from a street vendor and get to our last Roman sunset destination. Great news is: there's a stunning view of the sun retiring any evening from the bridges surrounding St. Angelo's bridge. Bad news is: Quite a few people know this little secret. Thanks to a bit of luck and a touch of ingenuity we have found a way around the scramble of people upon the bridge. Running alongside the Tiber River and beneath the bridges is an unkempt jungle of weeds and cement. Though it's not much to look at, it provides a stellar and private view of the sunset. 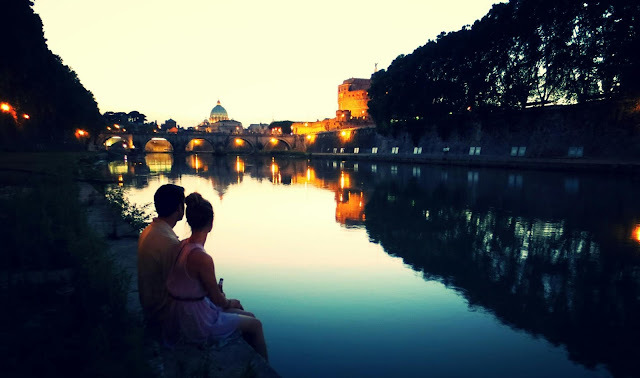 This area, easily accessible though it goes seemingly unnoticed, affords us the chance to dangle our feet just above the quiet water as we watch the sun dip quickly behind a silhouette of St. Peter's. Update: Since the publishing of this particular blog, I've discovered I've been bitten by a vicious roman spider! I suppose we weren't completely alone at our sunset viewing spot after all. Not to fret though, I'm already on a steady regimen of antibiotics due to the floridian arachnid that got me just days before our wedding!